The principle of Superposition states that when two waves of the same kind meet at a point in space, the resultant displacement at that point is the vector sum of the displacements that the two waves would separately produce at that point. 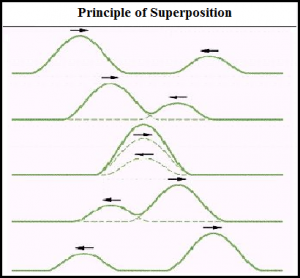 Interference refers to the superposing of two or more coherent waves to produce regions of maxima and minima in space, according to the Principle of Superposition. 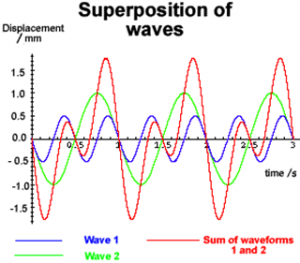 Coherent interference occurs when two or more waves arrive at the screen in phase with each other, such that the amplitude of the resultant wave is the sum of the amplitude of the individual waves. Destructive interference occurs when the two or more arrive out of phase with each other. A wave’s displacement is either positive or negative at a point in time and space. If more than one wave is at that point in time and space then a “net effect” will be observed. If two waves travel towards each other the waves will “add together” the amplitudes of vibration of the individual waves – they will interfere with one another. Consider two waves of the same frequency and amplitude travelling each other (in opposite directions). When they interact if the waves are in antiphase at that moment in time they will cancel each other out. Two waves that are in phase (temporally) will result in a net wave envelope of the same frequency, and two waves that are in phase (spatially) will result in a wave envelope of the same wavelength. However the waves will have double amplitude. When waves are slightly out of phase the wave envelope is very interesting. Now, consider the blue and green waveforms below. They are slightly out of phase. The red waveform is the “net result” of the two waveforms travelling through a medium. The summing of the waves gives rise to “beats” – variations in amplitude that occur at a regular interval. The more in phase the green and blue waves are the longer the beat period would be. This is used to true instruments such as the guitar. The principle of superposition may be applied to waves whenever two (or more) waves are travelling through the same medium at the same time. The waves pass through each other without being disturbed. The net displacement of the medium at any point in space or time, is simply the sum of the individual wave displacements. The doted lines are included so that we can observe that the two waves do indeed pass each other undisturbed. This applies to both for waves which are finite in length (wave pulses) or which are continuous sine waves.